Finding your professional calling can lead a person on a rather winding path. Within a short time of our visit, though, it was apparent that Sara & Rocky Garza are well on their way down that path. The two are a very specific breed of wedding photographer; outdoor destination, romantic elopement, family and close friend affairs. Their perspective is distinct and their brand is focused, both traits that any small business owner can appreciate. But their unique way of seeing and doing things extends beyond their “day job”. It seems to be part and parcel to their home life as well. After all, they work from home so it makes sense that the two would be in sync. Personality, home style, values, professional pursuit, hobbies, his and hers, family history… they’re all related. And that’s precisely why I chose to launch Our Style Stories with these two. They embody so much of what I look for in the people I will be featuring! Creative enthusiasm, an open mindset, distinct personal style, interest in creating and nurturing a beautiful home life, a passion for their work, and a genuine whole-heartedness for life. So, while in one sense this inaugural post introduces Sara and Rocky, at the same time it should give you an idea of what to expect from this blog in general. I know you’ll enjoy stepping into their world for a bit. 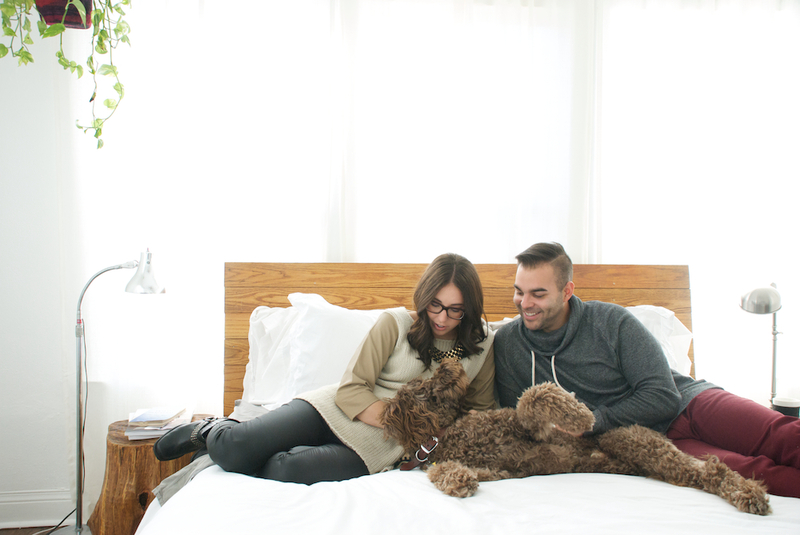 Now, for the fun stuff… Sara & Rocky’s industrialized 1927 Tudor bungalow! Continue scrolling for the style portion of their feature and then come back tomorrow for their story. 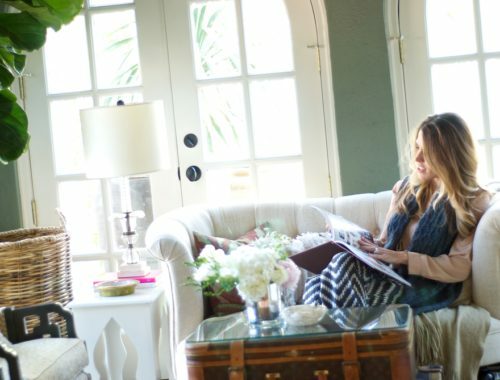 I sat down and chatted with them about their business, where they shop, and why they love working from home. It’s a good one… don’t miss it! Now, this isn’t the end, folks. Oh no! There is so much more to this story of Sara & Rocky Garza. Come back tomorrow to hear a clip from our conversation in which we talk about being a small business owner, starting out in the wedding photography industry, and, of course, shopping! I love the Garzas!!! Their home is really one to admire. So much white, beautiful light! Yes!! The white, open rooms are so fresh and relaxing! 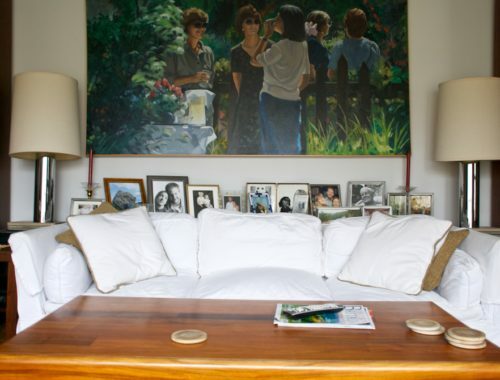 Love the coffee table and the lamp on the side table. Great photos too. Looking forward to more posts. Congratulations! The coffee table was made by Rocky… He’s quite the handy guy! Thanks for visiting, Sheila! It was such a delight to visit with Sara and Rocky. Hi Neha! So glad you found me. 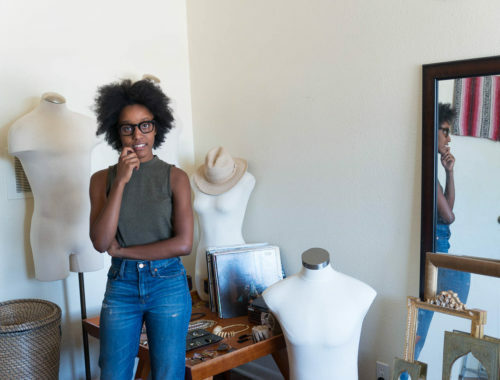 There are so many wonderful, creative, stylish people in the Metroplex! You have lots to look forward to. Thanks for following!